DTH v Chron Fundraising Challenge: Who is No. 1? Every year, the biggest rivalry in college basketball plays out in the pages of The Daily Tar Heel at UNC and The Chronicle at Duke. These two college media programs are as storied as the basketball teams they cover. Both have a tradition of excellence -- they compete for awards and bragging rights, and their grads often compete for the best post-grad journalism jobs. 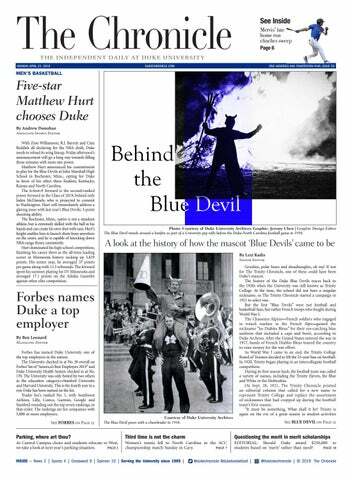 This year, the rivals are joining forces to make a special Rivalry Edition (both on-campus and online Feb. 20) and to see which program can raise the most money between Feb. 1 and 20 (the date of the first UNC-Duke basketball). Both nonprofit organizations are committed to funding the college media experience on our campuses for the long haul. In the short term, that takes some investment from our alumni and friends as we find new ways to generate revenue and streamline our independent operations. Help us beat your rival and support a great cause - donate here if you're a Tar Heel and here if you’re a Devil. May the best team win.